Despite the government shutdown, the Obama administration has continued secret negotiations to complete what is known as the Trans-Pacific Partnership, or TPP. The expansive plan is a proposed free-trade agreement between the U.S., Australia, Brunei, Chile, Canada, Japan, Malaysia, Mexico, New Zealand, Peru, Singapore and Vietnam. The agreement would create new guidelines for everything from food safety to fracking, financial markets, medical prices, copyright rules and Internet freedom. The TPP negotiations have been criticized by politicians and advocacy groups alike for their secrecy. The few aspects of the partnership leaked to the public indicate an expansive agenda with highly limited congressional oversight. A New York Times opinion piece previously called the deal the "most significant international commercial agreement since the creation of the World Trade Organization in 1995." Last week, the White House website released a joint statement with the other proposed TPP signatories affirming "our countries are on track to complete the Trans-Pacific Partnership negotiations." "Ministers and negotiators have made significant progress in recent months on all the legal texts and annexes on access to our respective goods, services, investment, financial services, government procurement, and temporary entry markets," the White House said. 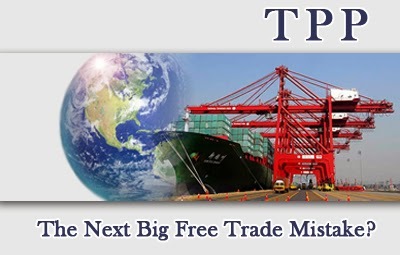 The statement did not divulge details of the partnership other than to suggest a final TPP agreement "must reflect our common vision to establish a comprehensive, next-generation model for addressing both new and traditional trade and investment issues, supporting the creation and retention of jobs and promoting economic development in our countries." In February, the Open the Government organization sent a letter to Obama blasting the lack of transparency surrounding the TPP talks, stating the negotiations have been "conducted in unprecedented secrecy." "Despite the fact the deal may significantly affect the way we live our lives by limiting our public protections, there has been no public access to even the most fundamental draft agreement texts and other documents," read the letter. The missive was signed by advocacy groups such as OpenTheGovernment.org, Project On Government Oversight, ARTICLE 19 and the Global Campaign for Freedom of Expression and Information. The groups warned issues being secretly negotiated include "patent and copyright, land use, food and product standards, natural resources, professional licensing, government procurement, financial practices, healthcare, energy, telecommunications, and other service sector regulations." Normally free-trade agreements must be authorized by a majority of the House and Senate, usually in lengthy proceedings. However, the White House is seeking what is known as "trade promotion authority" which would fast track approval of the TPP by requiring Congress to vote on the likely lengthy trade agreement within 90 days and without any amendments. The authority also allows Obama to sign the agreement before Congress even has a chance to vote on it, with lawmakers getting only a quick post-facto vote. A number of lawmakers have been speaking out about the secret TPP talks. Sen. Ron Wyden, D-Ore., recently proposed legislation requiring the White House to disclose all TPP documents to members of Congress. "The majority of Congress is being kept in the dark as to the substance of the TPP negotiations, while representatives of U.S. corporations—like Halliburton, Chevron, PHRMA, Comcast, and the Motion Picture Association of America—are being consulted and made privy to details of the agreement," said Wyden. However, Obama has so far refused to give Congress a copy of the draft agreement. The TPP is "more than just a trade deal," wrote Lori Wallach and Ben Beachy of Public Citizen's Global Trade Watch in a New York Times op-ed last June. "Only 5 of its 29 chapters cover traditional trade matters, like tariffs or quotas. The others impose parameters on non-trade policies. Existing and future American laws must be altered to conform with these terms, or trade sanctions can be imposed against American exports." Wallach and Beachy spotlighted several leaks in the proposed TPP text, including one that would regulate the price of medicine. "Pharmaceutical companies, which are among those enjoying access to negotiators as 'advisers,' have long lobbied against government efforts to keep the cost of medicines down. Under the agreement, these companies could challenge such measures by claiming that they undermined their new rights granted by the deal." Amnesty International USA warned draft TPP provisions related to patents for pharmaceuticals "risk stifling the development and production of generic medicines, by strengthening and deepening monopoly protections." Another leak revealed the TPP would grant more incentives to relocate domestic manufacturing offshore, Wallach and Beachy related. Jim Hightower, a progressive activist, wrote the TPP incorporates elements similar to the Stop Online Piracy Act. Hightower wrote the deal would "transform Internet service providers into a private, Big Brother police force, empowered to monitor our 'user activity,' arbitrarily take down our content and cut off our access to the Internet." Indeed, Internet freedom advocacy groups have been protesting the TPP, taking specific issue with leaked proposals that would enact strict intellectual property restraints that would effectively change U.S. copyright law. The Electronic Frontier Foundation argued the TPP would "restrict the ability of Congress to engage in domestic law reform to meet the evolving IP needs of American citizens and the innovative technology sector." In a petition signed by over 30 Internet freedom organizations, the group warned the TPP would "rewrite global rules on intellectual property enforcement."